The Yellow Jackets continue to roll as a strong defensive performance carried them to a 28-6 victory over No. 19 Clemson. No. 22 Georgia Tech recorded three interceptions, including pick-sixes by Jamal Golden and Chris Milton, and limited the Tigers to just 190 yards of total offense as its Coastal Division title dreams stay alive. In the first quarter, following a turnover at midfield by the Yellow Jackets (9-2, 6-2 ACC), freshman quarterback Deshaun Watson drove Clemson (7-3, 6-2 ACC) downfield to the 10-yard line before settling with a 27-yard field goal by Ammon Lakip for the early lead. The next Tiger drive provided a sense of dread for fans in purple and orange as Watson left the game following a knee injury and would not return. Subsequently, the Georgia Tech defense would emerge. With Clemson deep in the GT red zone, Jamal Golden intercepted a screen pass from backup quarterback Cole Stoudt and returned it 85 yards for the touchdown to go up 6-3 late in the first. 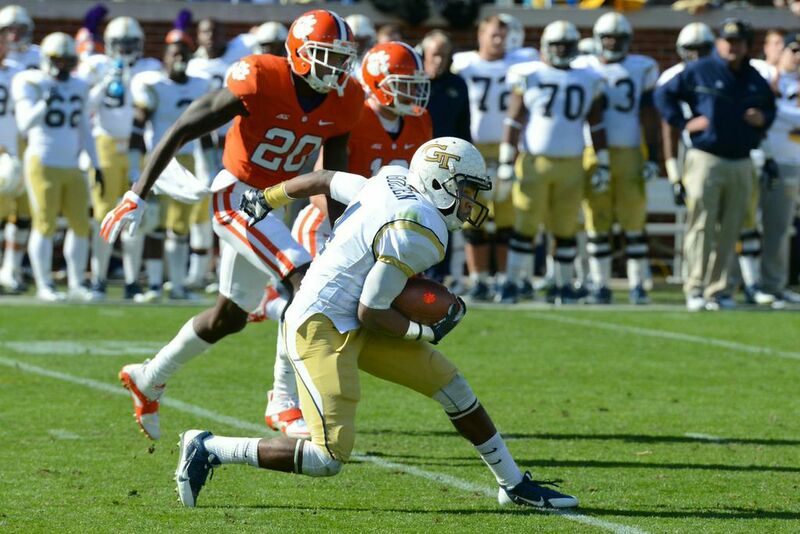 The Jackets pulled away in the third quarter when Justin Thomas connected with DeAndre Smelter for a five-yard score while the Tech defense haunted Stoudt yet again, intercepting the quarterback two more times, including one returned for 62 yards by Milton for the second pick-six of the contest to make it 25-6, in turn sealing the victory. The Tech offense bounced back after being held to just 10 yards of offense in the first quarter to total 353 yards. Quarterback Justin Thomas paced the offense, completing 8-of-11 passing for 101 yards and a touchdown while rushing for 46 yards. Harrison Butker went 3-for-4 on field goal attempts, including a long of 41 yards. Smelter logged five receptions for 77 yards as he became 21st player in Tech history to go over 1,000 yards receiving.